Similar look to the 1993 Storm of the Century but further east and not as big geographically. On the flip side it looks like a warm up is looming, so get that 2011 license in order to cash in on some News Years Day trout! When it is all said and done this year will go down most likely as a 'normal' precip year - - despite what we remember as a hot and dry summer. Low and warm water shut down quite a few trout streams early in the season, not much after the sulphurs. 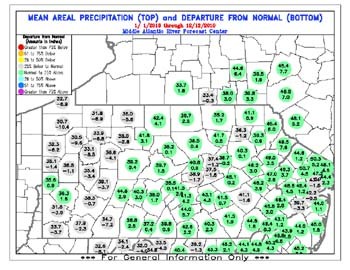 Then as the summer moved on the DRBC started directed releases from most of the larger reservoirs within the Delaware River watershed. In fact Beltzville was drawn down about 15' or so, but has now filled back to conservation pool level. Cannonsville got down to about 40% or so, and ran very dirty, but it too is back to its preferred elevation level. Small waters are at a nice level right now. So if you are one who likes the cold, you'll find some good color, and flows for the sub-surface stuff! That is the only way to describe the fall run this year. Lack of fish, except for a very brief couple of day flurry early-on in the season (October time frame), combined with rough surf has lead to a real sleeper of the season. Normally the mid-November timeframe is the peak for the shore-bound angler. This year it just never happened though. It is anyone's guess as to the reason for the lack of fish. One thing that is worth mentioning. Over the last few years we've seen a big decrease in then number of peanut bunker out front during the prime months. Why??! Rafts of peanuts beaing molested by predators is how we remember the fall run!